Illustration from the journal of Lady Maria Nugent. 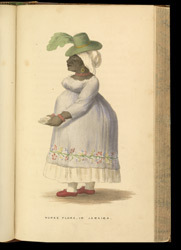 It depicts Flora, an enslaved woman who tended Maria during her pregnancy and the birth of her first child, George Edmund. Maria was nervous about the pregnancy and was suspicious of the herbs and charms that Flora suggested she should use to bring forward the birth of the baby.